There are 21 reviews of Costume National 21. The opening is light and herbal, but not green. As it dries down I get a dusty tonka bean. Futher into the drydown, it's sweet and powdery, kinda like 1 million but in a distant way, definitely not the bubble gum or screaming loudness. As it becomes a skin scent, it's just dry, sweet amber-vanilla. Because of the opening, it could be more versatile than what I'm thinking, which is cooler weather and more dressed up. Just just keeps getting warmer as it dries down. I get good projection and all workday longevity. A modern scent ,little gourmand ,but it's great fragrance for me. Nice fragrance with nothing special to make it stand out. It is soft, sweet, and spicy. Labdanum, oakmoss, patchouli balance the sweetness into obscurity. Toned down A*Men? This is luxurious. The previous comment on cashmere is right. Perhaps a bit sweet for me, but nevertheless a seamless scent. Very approachable, and not engulfing like A*Men. I’m thinking winter, late night out in the city with friends? Nothing great, but well made. Pass. CoSTUME NATIONAL 21 is what you'd imagine robots in a lab in far future would come up with if asked to produce a cashmere sweater scent, and they only had access to a boatload of synthetics and a handful of ‘vintage’ natural materials. On the surface, it’s warm and fuzzy, but there are dark currents and sharp edges underneath. I like it because it’s exactly the kind of thing I want to wear when I want to feel comforted but don’t want to be lulled into complete torpor. It's cozy but edgy. This fragrance has layers and layers, not all of them easy to make out, so I’ll start at the top and work my way down. The opening is fruity, spicy, and woody, like a spoonful of mandarin jam spiked with dusty saffron and cinnamon. The mandarin rind and saffron combine with woody accents in a way that suggests booze. In fact, every time I put it on, I’m reminded (initially) of the orange rind and rum opening of Idole de Lubin. Immediately, though, it moves on from the boozy opening and this spoonful of fruity puree is dropped into a warm glass of milky white musk and sweet amber, and stirred through. Cashmeran, tonka beans, and vanilla join the party, and this whole layer becomes a white noise of fizzing but creamy white musk, orange-tinted milkshake, vanilla custard, sweet amber, and cozy wood accents. The texture is a thing of wonder – almost fuzzy to the touch, warm, silky, expansive – and yet, put your fingers to the wool and you will feel little spikes sticking out. In fact, 21 would be a soporific, over-simple gourmand treat were it not for the incredible base that the robots put together to fit underneath the cashmere sweater layer. Somehow, they stumbled across a small cache of organic, vintage materials on some planetary outpost, probably stuff used to make men’s powerhouse colognes in the 1970s – vetiver, moss, patchouli, clary sage, cedar, and caraway. The base provides a bitter, mossy, earthy counterpoint to the vanillic layers floating on top of it, and the scent is all the better for it. In fact, there is a musky, mossy feel to this that recalls the dark undertow of Caron’s musky Third Man, minus the fougere-ish elements of courmarin and lavender. The overall effect is therefore of a thick blanket of fuzzy, synthetic, sweet ‘white noise’ overlaid on a natural-feeling, organic base of mossy woods, musk, vetiver, and herbs – light and dark, natural and synthetic, female and male. The drydown is a protracted affair of salty, mineralic moss and a masculine musk. It’s a truly modern marvel of yin and yang. The robots done good. This is a dusty, powdery, peppery, sweet fragrance, & very autumnal in feel. Many reviews describe it as having a kind of creamy milk pudding vibe, but that's not what l get here. What l get is a sheer, woody patchouli in the opening, followed by a smooth heart rich with labdanum & tonka. A couple of hours in there's a touch of orange, & at this stage it reminds me a little of Anne Pliska. There's amber, sandalwood & moss in the base, & although it's not listed, l get a distinct whiff of tobacco. The moderate sillage lasts around five hours before fading close to the skin, & it's still there after twelve hours. l find this one deliciously comforting, & look forward to using up my sample during the autumn days to come. 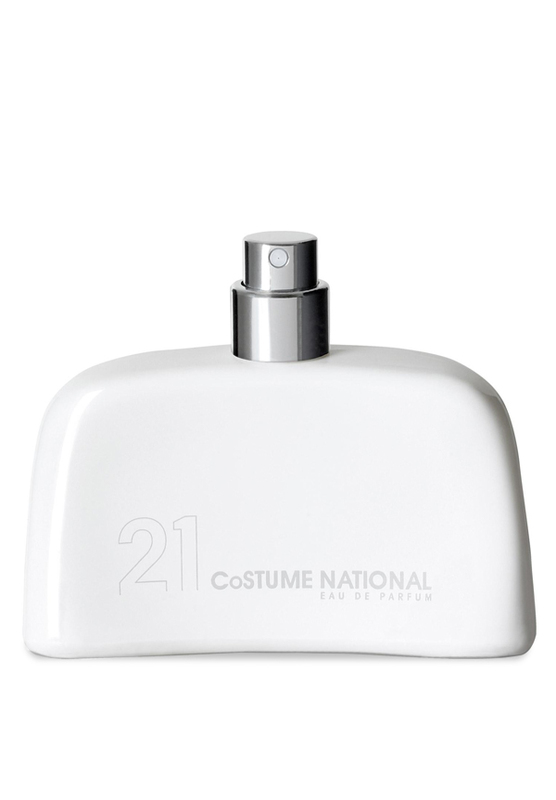 21 Costume National Eau de Parfum 1.7 oz. CoSTUME NATIONAL 21 Eau de Parfum 50ml 1.7oz / 30ml 1oz spray new sealed! CoSTUME NATIONAL 21 Eau de Parfum Spray, 3.4 fl. oz. There are no member images of Costume National 21 yet. Why not be the first? Costume National 21: Any overlap with Silver Shadow? Experience with Costume National 21? CdG Kyoto or Costume national 21 ?